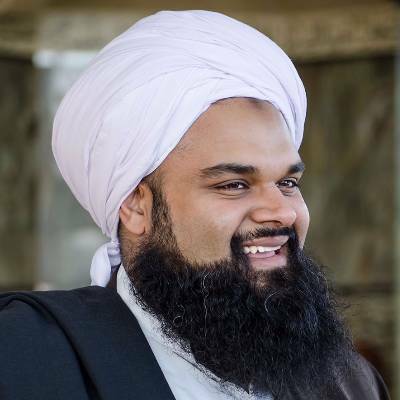 Shaykh Hamzah Wald Maqbul was born in Whittier, California, and lived in Southern California until the age of ten when he moved to Blaine, Washington. After graduating from Blaine High School, he went on to attend the University of Washington and in 2004 completed a Bachelors of Science in Biochemistry and a Bachelors of Arts in Near Eastern Languages and Civilizations. After graduation Hamzah went on to pursue traditional Islamic studies, which took him to a number of countries, including Syria and Egypt where he studied the Arabic language, Morocco, Mauritania, and UAE, where he studied the madhab of ImÄm MÄlik, grammar, usÅ«l al-hadÄ«th, and the two renditions of the qiraâ€™ah of ImÄm Nafiâ€˜, Warsh and Qalun, and finally Pakistan where he had the opportunity to study tafseer, usÅ«l al-á¸¥adÄ«th, á¸¥adÄ«th, â€˜ilm al-rijÄl and HanafÄ« fiqh. All of these studies culminated in him receiving an ijÄzat al-tadrÄ«s, literally meaning â€œa license to teach,â€ which is the equivalent in Pakistani Islamic seminaries to a MA in Arabic and Islamic studies, as well as an unbroken chain of transmission by which to narrate the á¸¥adÄ«th of such books as the Muwaá¹­á¹­aâ€™ of ImÄm MÄlik, the á¹¢iá¸¥aá¸¥ al-Sittah (BukhÄrÄ«, Muslim, AbÅ« DawÅ«d, TirmidhÄ«, NasÄâ€™Ä« and Ibn MÄjah), and the Shará¸¥ MaÊ¿ÄnÄ« al-AthÄr of Imam al-Taá¸¥ÄwÄ«.